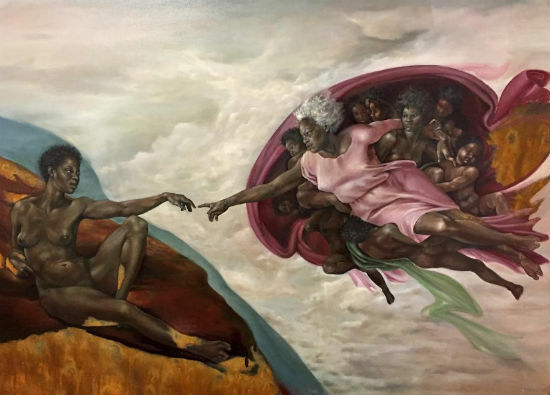 Afro-Latina artist reimagines Michelangelo's "The Creation of Adam"
At first encounter, Harmonia Rosales’s “The Creation of God” is striking. It is beautiful and familiar. Like Michelangelo’s “The Creation of Adam,” Rosales’s painting portrays the creation of humankind. However, the skin tones, gender and story being depicted by the artist are strikingly different. In Rosales’s painting, God is a black grandmother who creates a humanity in her image, while beautiful, black angels surround her. The artist depicts Adam through the root of the word, adamah, which is feminine. Adamah expresses the human creature, male and female and made of earth. The earth on which the new human rests is evocative of the global South in its colors and contours, some of which still remain visible on the woman’s flesh. As the title suggests, the work reimagines the Imago Dei. What kind of image of God is thehuman person if we dare to imagine God differently? Which humans have been excluded from seeing themselves in the image of God? And what new insights into God and our relationship to God will we gain if we engage with the ways others express their image of God? God is a black grandmother who creates a humanity in her image. What the considerable angst and controversy surrounding Rosales’s new painting disclose is that we need new tools to work with art. The often adversarial relationship between art and religion in modernity need not be, and one of the first people to extend an open and appreciative hand to artists was Pope John Paul II, who penned a pastoral letter simply titled “To Artists”in 1999. In it he insists that “with loving regard, the divine Artist passes on to the human artist a spark of his own surpassing wisdom, calling him to share in his creative power.” Rosales’s painting forces us to ask a double-sided question: How are we to view God’s act of creation? And, how do we view this particular artist’s act of creation in this one painting? Art and faith are both about relationships dealing with our heart, which make both very complicated. Many of us in the Western world have become accustomed to encountering “art” only in museums and galleries. We often focus on referring to a work of art by the artist’s name: “branding it” so to speak, “look at the Warhol!” This diminishes the work’s own voice. As nonconforming artists have shown—think Marcel Duchamp’s “Readymades” or Banksy’s “Exit Through the Gift Shop”—just calling something “art” or adding a famous signature to it can “elevate” an object, not on its merit but on the basis of the fame of the artist. Almost all art considered great features white European faces, produced by men and for men. This narrows human history and its stories, forcing an interpretation that focuses on one very particular perspective and excludes all others. These limitations of art are generally accepted preconceptions, which sadly remove art from its vital role within human communities, including art’s religious functions. “The Creation of God,” by Harmonia Rosales, confronts these tropes and fulfills art’s religious function of creating community and engaging our foundational stories as skillfully as Michelangelo’s first version of the Creation stories in Genesis did in the 16th century. By the time I came upon “The Creation of God” on Instagram a few days after its posting, it had been viewed by thousands of people and generated hundreds of comments, including some negative ones in which Rosales was accused of cultural appropriation and tarnishing Michelangelo’s legacy. Encountering art is building a relationship, and let’s face it, relationships are hard. As with the beginning of any good relationship, we must allow the art to speak for itself. This takes discipline. To give art the right to just be does not mean we don’t bring questions to it but rather that we become aware of these questions and the insights they produce. As I come awake to my reactions, the art opens itself up to me and in an act of reciprocity discloses much about me to myself. So, take a moment to just take in the painting, what is happening in you right now? Note the year of production: 2017. Note the location: Chicago. Art that has longevity arises out of the experiences of communities, out of their history, their joys and sorrows. How do you see this concrete historical setting revealing itself in this work? What can you see about the life and faith of Chicago in 2017 now that you could not see before? Without collapsing the work to the artist’s intentions or biography, knowing her facilitates a fuller encounter with the work. Here it is important to notice the difference each artist’s unique experience makes to their interpretation of the Genesis stories. What is revealed as Michelangelo interprets Genesis as a European Renaissance man and Harmonia Rosales as a black Latina in the United States of the 21st century? Paying attention to the communities for whom a work was made, their appreciation or rejection, and how this shifts in subsequent communities across time and place is an act that discloses the complexity of human diversity. Our love, rejection, questions, acts of preservation or, in a religious sense, acts of veneration of a work of art allow us to know those who have been and are part of this relationship we have just entered. We are all kin now; we share a love. And so, we do not have to reject Michelangelo’s “Creation of Adam” to love Rosales’s “Creation of God”—there is enough room in our hearts to love both. The communities that gave rise to them have encountered them and will encounter them in the future in all their glorious difference. An honest relationship with art can bear great fruit; we just need to do the hard work.